CT’s recently introduced lightweight LED system has been used on three spectacular projects since its introduction in September, each demonstrating how this product can and will re-define the way LED screens can be used in touring and event environments. 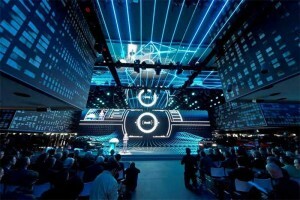 The first application saw 363m2 installed as an LED ceiling for the Audi booth at the Frankfurt IAA car show. The ground-breaking stand design featured an inverted city with buildings, trees and other architectural elements suspended within the purpose-built exhibit hall. The LED ceiling displayed graphical content representing traffic and movement on the roads between reflected tower blocks. This project would have been impossible with any other LED product as the entire 363m2 system weighed less than four tonnes including purpose-built super modules which allowed the display to be transported and installed in pre-fabricated sections each measuring 1.5m x 3m and weighing around 100kg. Immediately following the Frankfurt show the system was turned around and reconfigured for two dramatic productions in the Arnhem Geldredome. The first a concert for Dutch Superstars Nick and Simon saw the Glux installed as a 16m x 9m backdrop displaying some incredible animated content transforming the stage set into a variety of three-dimensional industrial landscapes, with multiple live images dropped into appropriate frames. Following the Nick and Simon shows the entire system was stripped and re-installed into a spectacular 16 screen grid for the Symphonica in Rosso with Anouk, with each screen measuring 6m wide x 3m high. 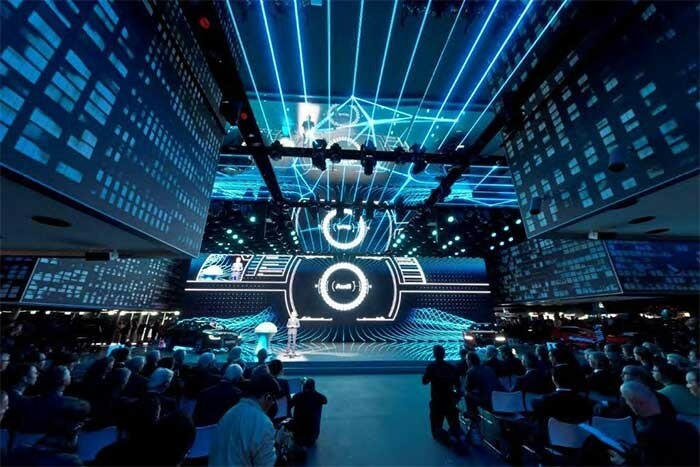 The screens arranged on a 4x4 matrix as the centrepiece of the stage each rotated up to 720 degrees about the horizontal axis with multiple moving lights attached to the rear face. The creative potential of this ground-breaking product was fully utilised including the almost 50% transparency (another major improvement at this resolution). As if these 16 screens were not enough the stage also incorporated a pair of massive side screens built from Flyer 18 and measuring 13m high x 6m wide. To improve side stage viewing two further GLUX Carbon 10 side screens were added, each measuring 1.5m wide x 3m high but weighing less than 100kg. This allowed them to be suspended from a single upright truss. They were installed in around 15 minutes and the entire screen was carried in a single flightcase, no larger than a typical cable trunk. Overall the show utilised 453m2 of LED product. In addition to these major events smaller systems are already in use on TV series in the UK and Germany, on The Arctic Monkey’s Tour and shortly for the Dubai Airshow. CT and its partners already have access to over 1,000m2 of this product which is believed will have a major impact on the touring and live events industry. The ultra lightweight, speed of rigging and low operating cost mean productions with modest budgets can now incorporate spectacular moving screens. Simple Imag displays can also be installed in arenas with minimal rigging and power requirements and without the ambient light and throw limitations of projection system.